Shares of Etsy nearly doubled after the startup company went public Thursday under the ticker symbol ETSY. The e-commerce craft marketplace made a strong showing, opening up at $31 a share, up 94 percent from its initial public offering of $16 a share. The startup had its humble beginnings 10 years earlier in Brooklyn. Etsy was created by three New York University students after one of them, Robert Kalin, couldn’t find a market to sell a wood-encased computer he had made. Today, the company has 685 employees worldwide and its corporate headquarters include a bicycle room, a pingpong table, several pet dogs, and a cafeteria with a sign that reads “Eatsy Meat” above it. The company has 1.4 million active sellers and 29 million items listed. 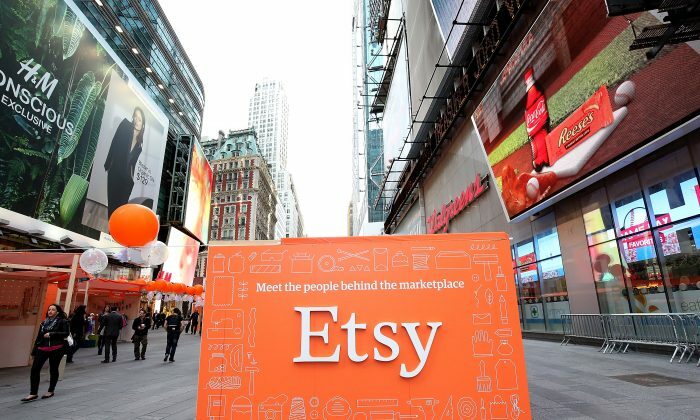 As Etsy evolves from its indie roots, many former sellers have expressed concerns over the company’s policy change in 2013 to allow mass manufacturing operations. The new policies “allow you to partner with manufacturers to produce your designs,” according to Etsy’s website. A mass produced T-shirt from China could be seen side-by-side with a homemaker’s uniquely made ornament. Those familiar with Etsy’s website said they began to see a flood of products from China. We don’t believe that people and profit are mutually exclusive. CEO Chad Dickerson defended Etsy in a blog post Thursday against claims that the company was losing touch with its indie origins. He wrote that although Etsy would now bear a new set of responsibilities to shareholders, the company still supports human-centered craftsmanship. Is Etsy Losing Its Soul With IPO? Dickerson rang the opening bell for the Nasdaq stock market early Thursday morning with dozens of Etsy sellers. One of the sellers, Allison Faunce from Massachusetts, sells superhero capes for children. Another makes hand-printed wooden blocks. They held a fair outside of Nasdaq, in the middle of Times Square. The handmade crafts fair right outside of Nasdaq could serve as a metaphor for Etsy, which depends on its sellers, but is now adding shareholders to the mix. Despite rumours that Facebook usage is in decline, it remains the most popular form of social media. Etsy filed $100 million for its initial public offering Wednesday evening. For the e-commerce Brooklyn-based company poised to go public, it’s an appropriate time for soul-searching.